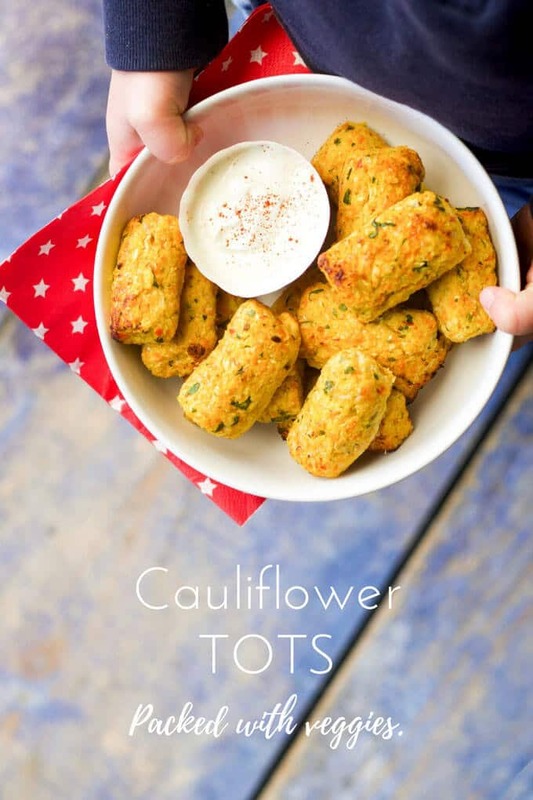 Cauliflower tots -packed with three other veggies. Perfect for kids. 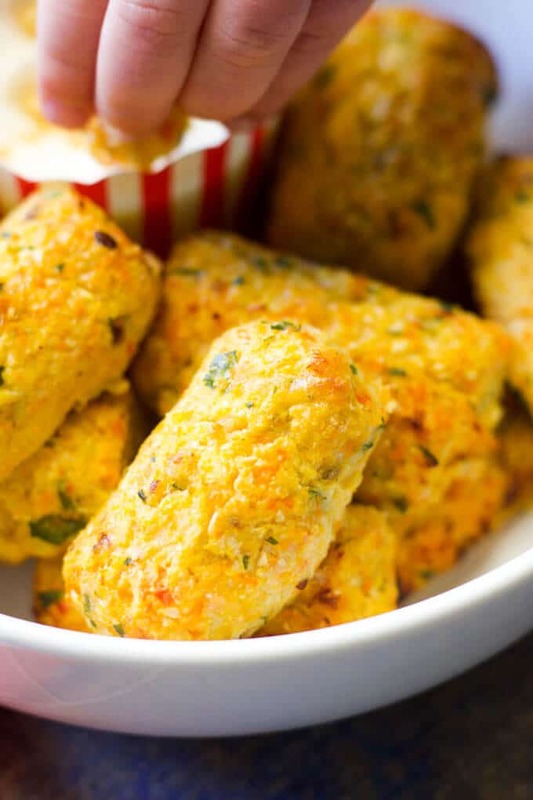 These cauliflower tots contain cauliflower, carrots, onion and capsicum pepper. 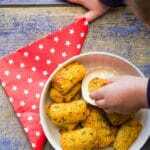 A great veggie packed finger food for kids. As the end of the week approaches, and the fridge is looking bare, I have to start getting inventive in the kitchen. My Mum used to call concoctions like this “end of cupboard meals” and I remember, as a kid, looking forward to seeing what her end of cupboard meal would be each week. With a left over cauliflower in the fridge, these cauliflower tots were last week’s end of cupboard meal. 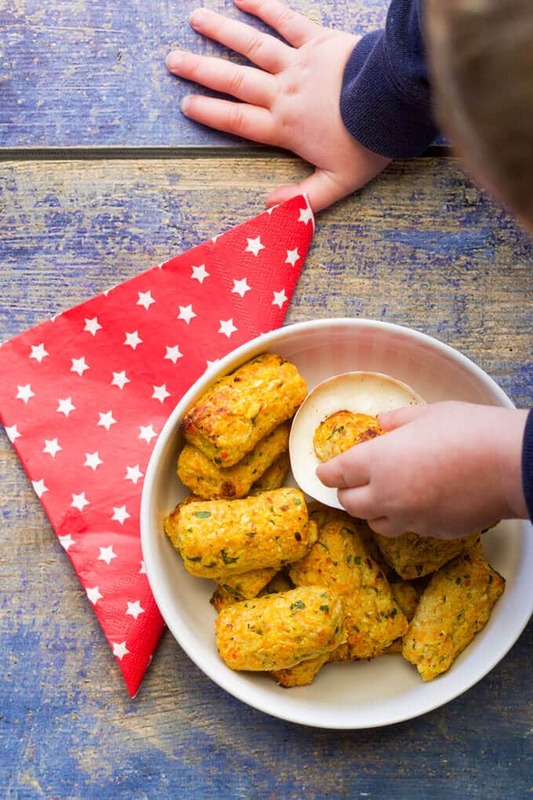 The boys loved them, as they do with most finger foods, and Finn said “Mum, you have to put these on Healthy Little Foodies” So, with the seal of approval from my 5 and 2 year old, I have decided to share the recipe! I love that these Cauliflower tots are not only packed with cauliflower but also contain carrot, onion and capsicum pepper. Not bad for a little finger food. The more veggies the better in my opinion. A great finger food for kids. Packed with four different vegetables. Steam carrots for ten minutes. In the last five minutes add the cauliflower. Drain and rinse the cauliflower and carrots with cold water. Pat dry and add to a food processor. Pulse until uniformly chopped (you don't want to over pulse) Add the capsicum / pepper and spring onion and pulse until combined. In a mixing bowl combine all the ingredients. Mix with your hands until combined. Spoon 1 tablespoon of the mixture into your hand and roll into a tot shape. Repeat until all the mixture is used up. Place on the prepared baking tray and bake for 20 mins. Do you think this recipe would work without the cheese? My little one has an issue with dairy. Hi Jenny, they should hold together well but may lack a little in flavour without the cheese. You could maybe add some more herbs and /or spices to add flavour. Just a suggestion for cheesy flavor you could try nutritional yeast. Jenny, did you try these without the cheese? My 1 year old has an issue with dairy as well. It is greek yoghurt mixed with a little mayo and smoked paprika. My go to super quick dip! Would you freeze after baking, or before? Hi Joni, you could do either really. I’d freeze on a lined baking tray and once frozen I would then transfer to a container / bag. Thanks! That’s the method I was thinking of using, just wasn’t sure if it was good to cook them beforehand or not. Hi is there an alternative to egg in these to help bind them? Thanks!! could I try to make these in mini muffin tray? Hi Katarina, to be honest, I’m not really sure. It may stick but is worth a try. This recipe is FAB! My little one is a bit choosy with meal time and only eats muffins (which I try to pack with veg! ), and this is the first thing apart from muffins she’s enjoyed in a long time! Thank you! I didn’t use capsicum but added pumpkin and sweet potato and spinach, and they are still tasty and I’ve been making them in bulk!